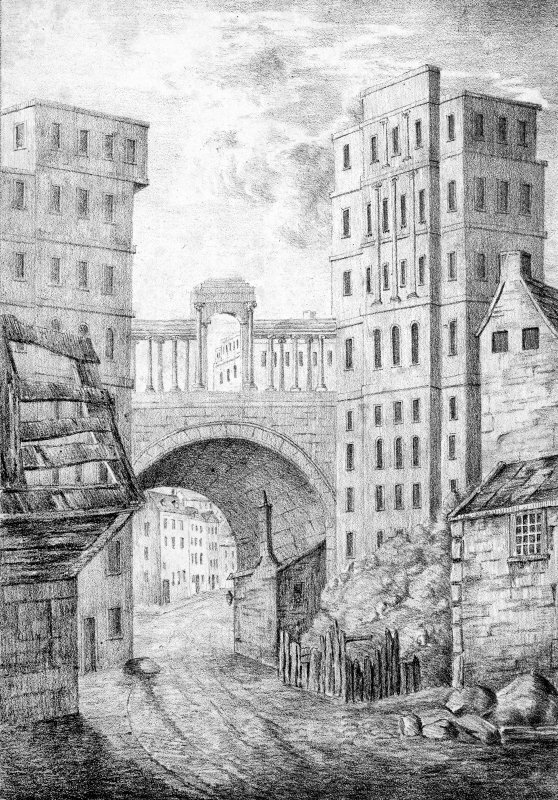 View from S of Regents Bridge Arch on S side of Waterloo Place. 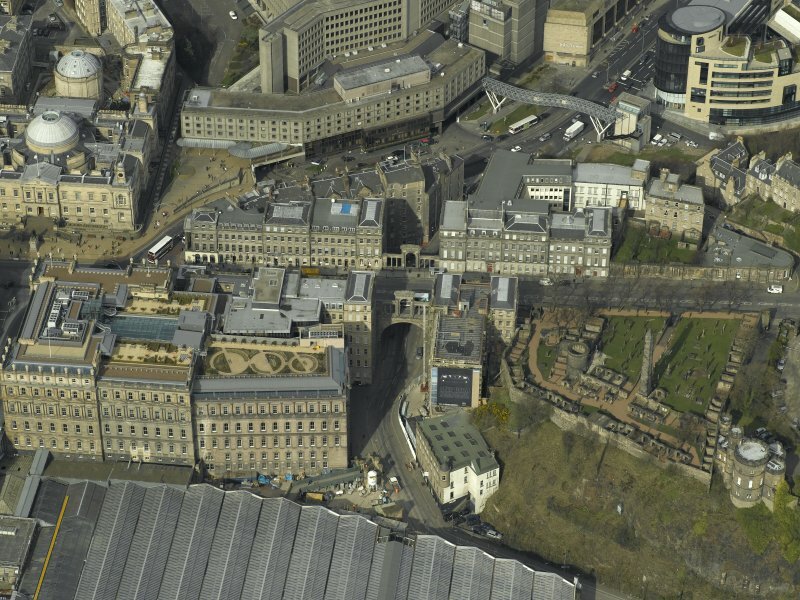 Oblique aerial view centred on the road bridge, burial-ground and theatre, taken from the NNW. 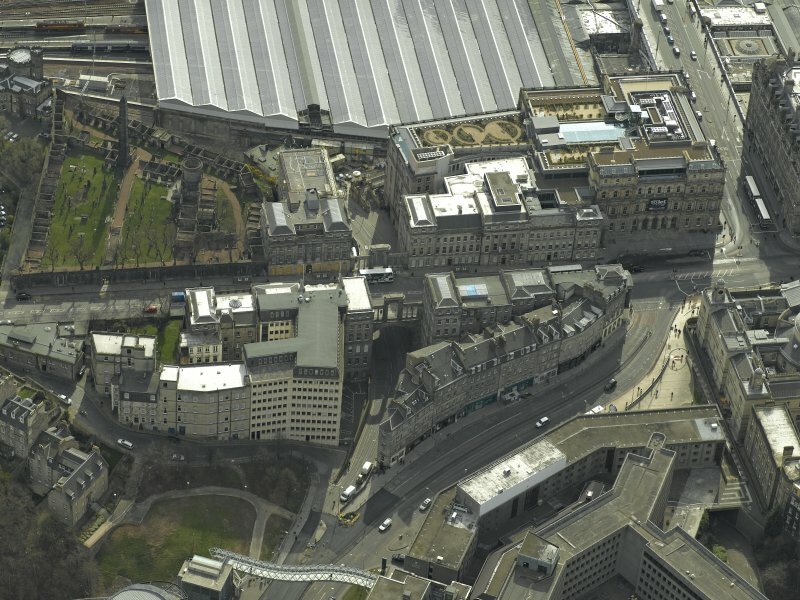 Oblique aerial view centred on the road bridge with the burial-ground adjacent, taken from the E.
Oblique aerial view of Governor's House at St Andrew's House, Regent Bridge and Old Calton Burial Ground, looking N.
View of Waterloo Place during construction. 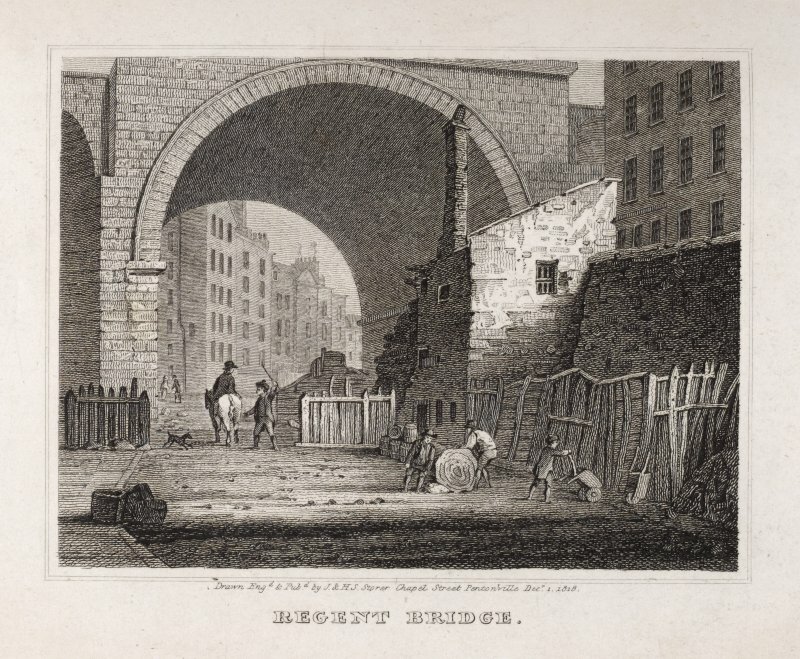 Inscribed: 'The Regent Bridge, Register Office and Princes Street from the East'. 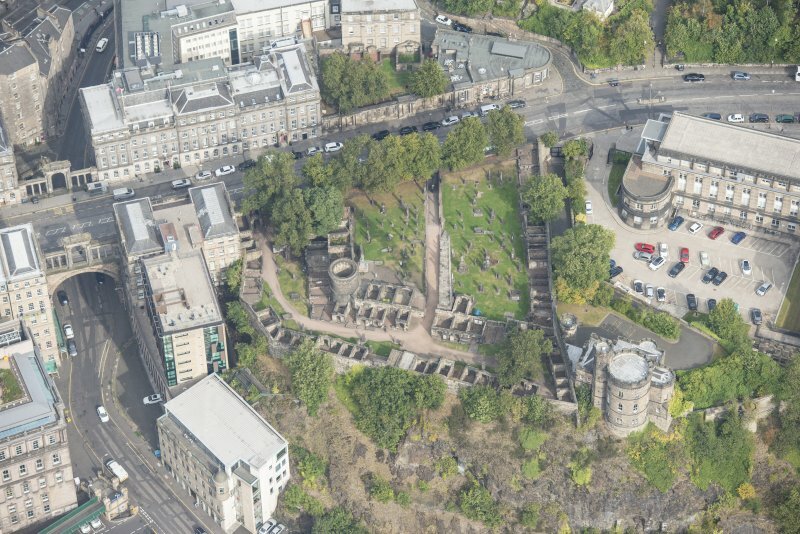 Oblique aerial view centred on the road bridge with the Old Calton burial-ground adjacent, taken from the SSE. 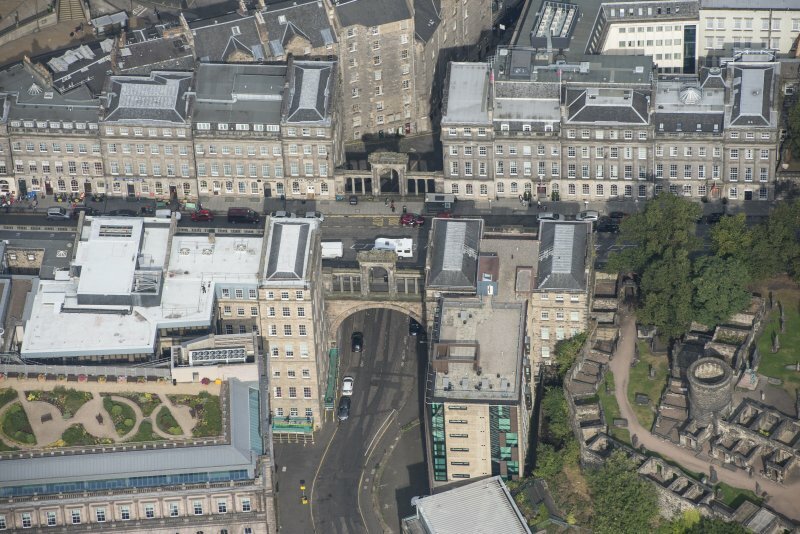 Oblique aerial view of Regent Bridge, looking NNW. 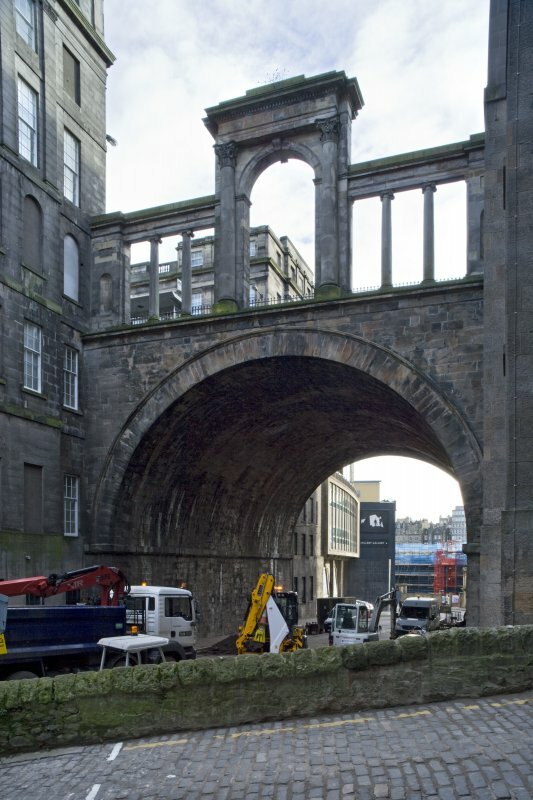 View from S of Regents Bridge Arch on N side of Waterloo Place. 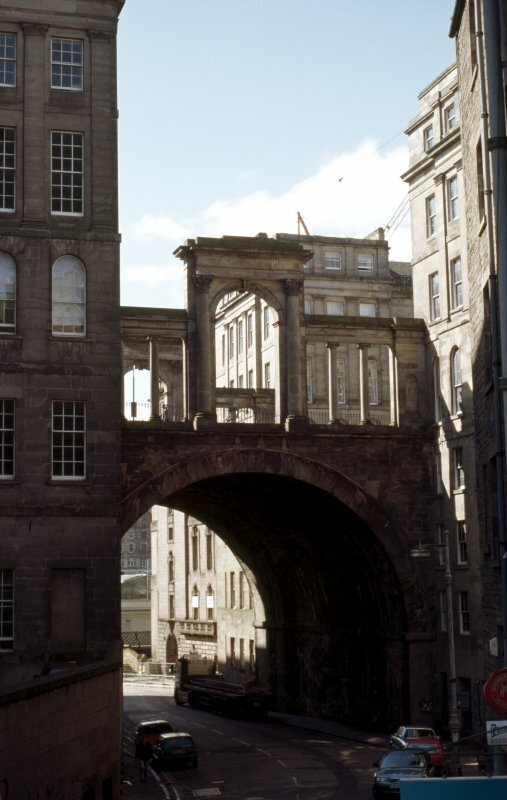 This bridge carries Waterloo Place (which here forms the A1) over Calton Road to the SW of Calton Hill. 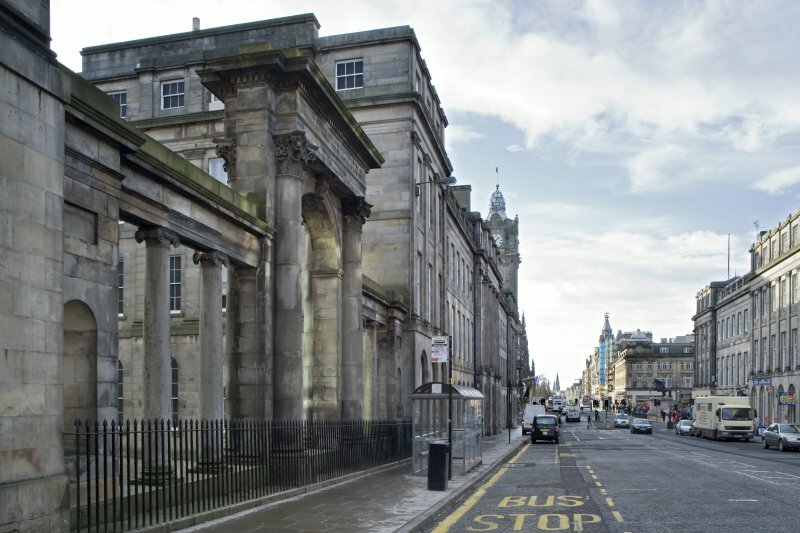 Waterloo Place forms the link between Princes Strret (to the W) and Regent Road (to the E). 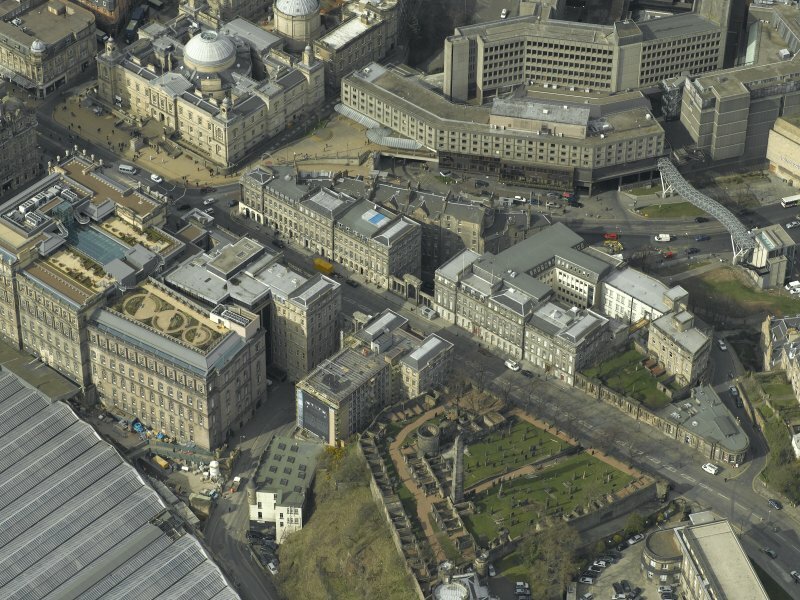 Information from RCAHMS (RJCM), 16 May 2006. 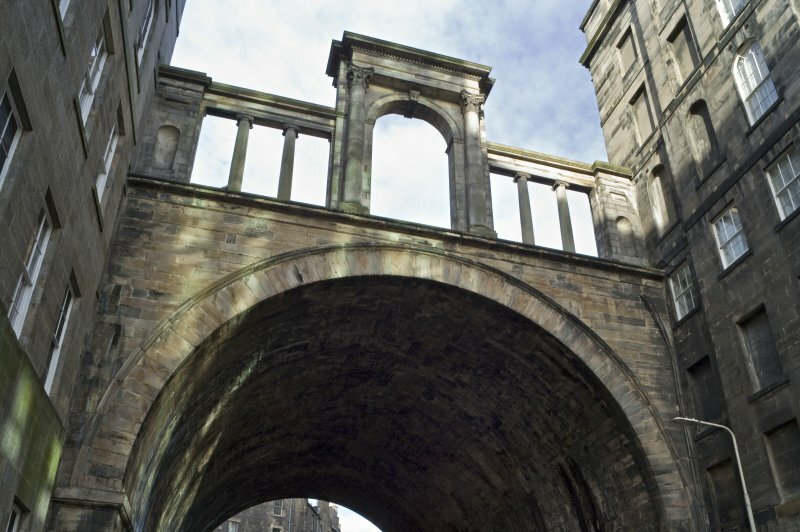 In a letter to Lord melville, Sir John Marjoribanks suggests that they should visit the bridge and while there he would wish "to show its lions" to him. 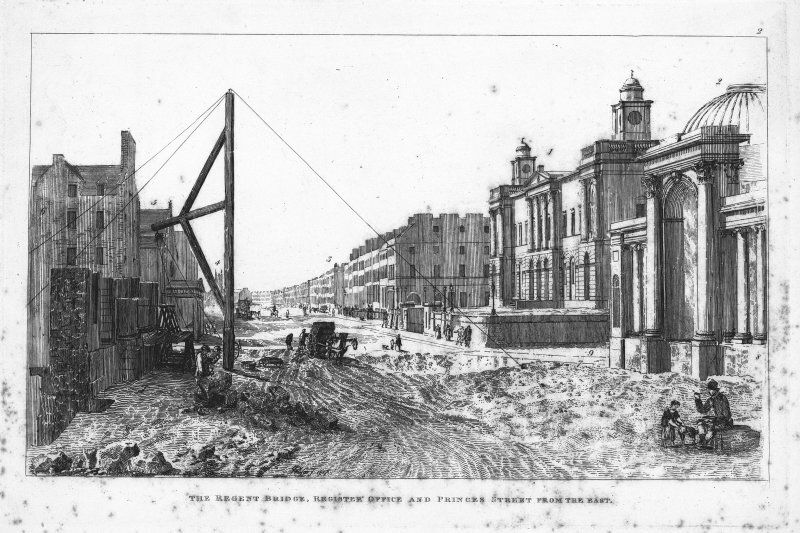 "Also desirable to include the unfinished end of York Place in The Act of Parlt... 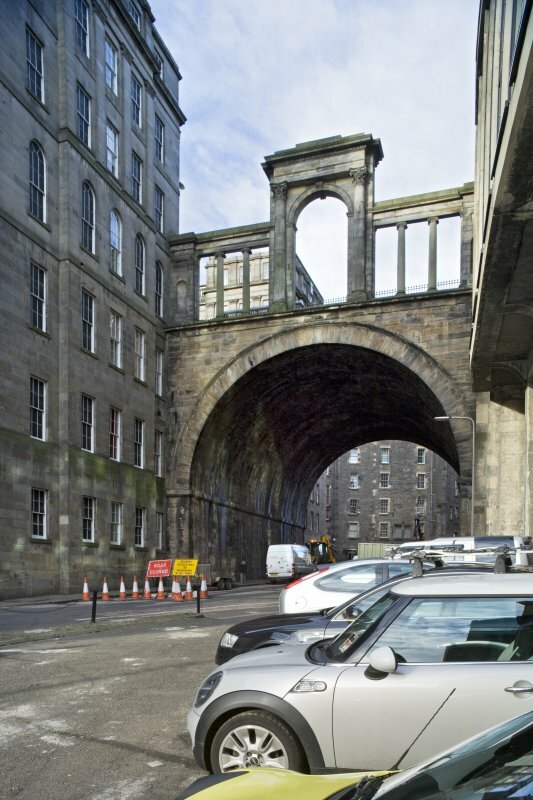 The road through York Place being a great thoroughfare to Leith"
Central arch with pediment supported on Corinthian columns, one on either side. Capitals of columns carved in high relief with acanthus leaves and scroll work. 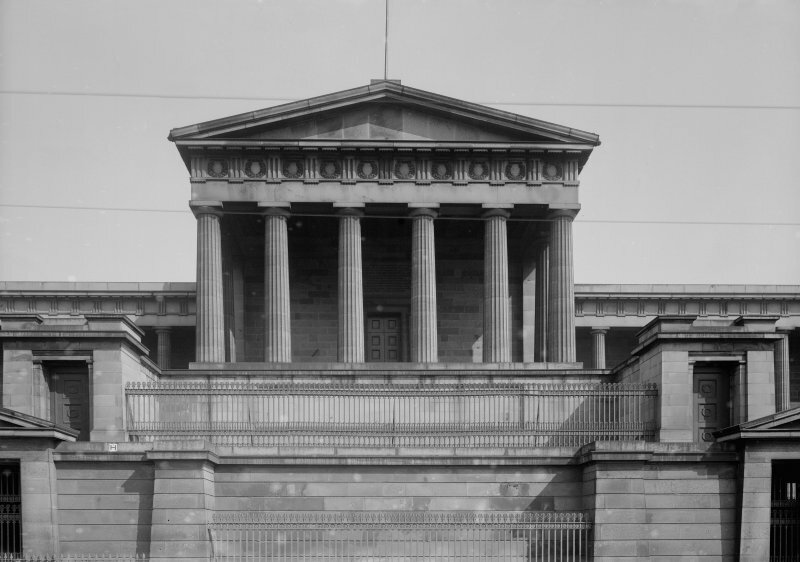 Two smaller columns on each side with Ionic capitals. 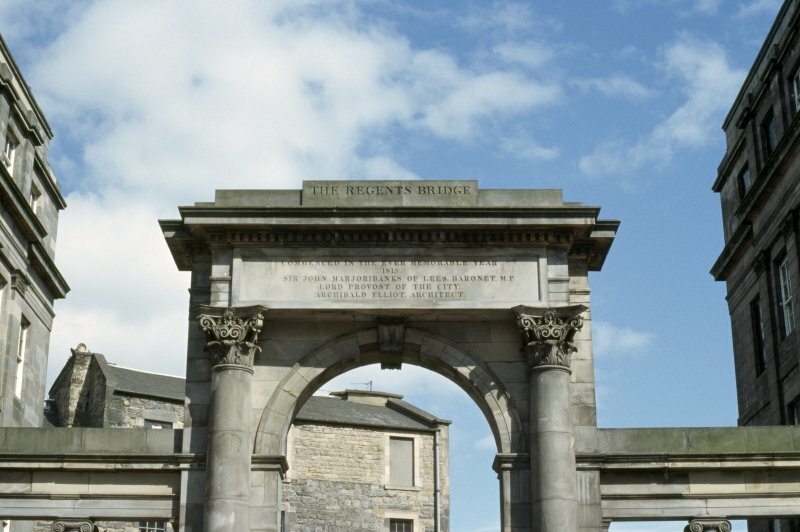 Inscription in panel in centre of pediment. 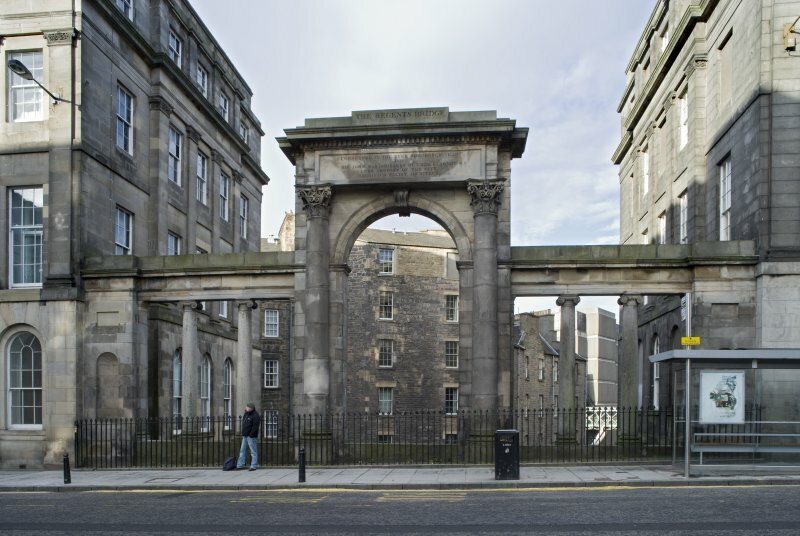 Central arch with pediment supported by Corinthian columns, one on either side. Capitals of columns carved in high relief with acanthus leaves and scroll work. 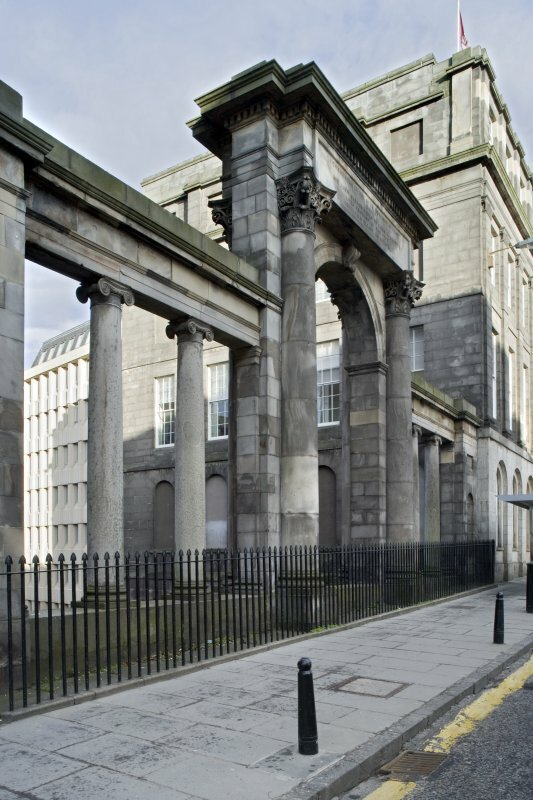 Two smaller columns on each side with Ionic capitals. Inscription in panel in centre of pediment. The 'ever memorable year 1815' is the year of the battle of Waterloo. 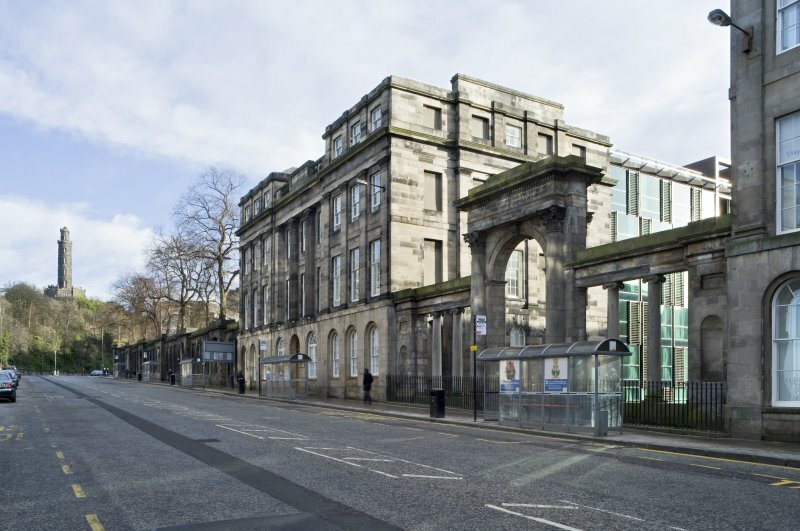 architects Playfair, Hamilton and Elliot. 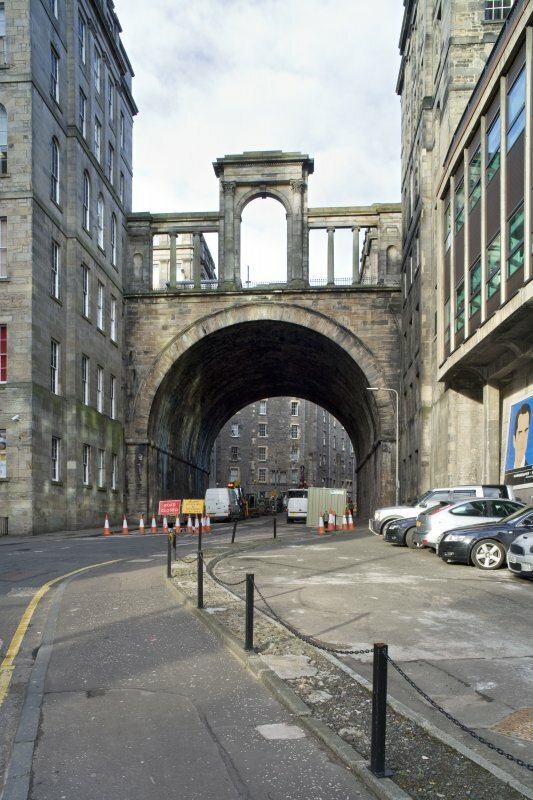 A key element of the Regent Road approach to Princes Street was the Regent Arch, semicircular masonry arch of 50 ft span built from 1815–19 carrying Waterloo Place over Lower Calton Street. 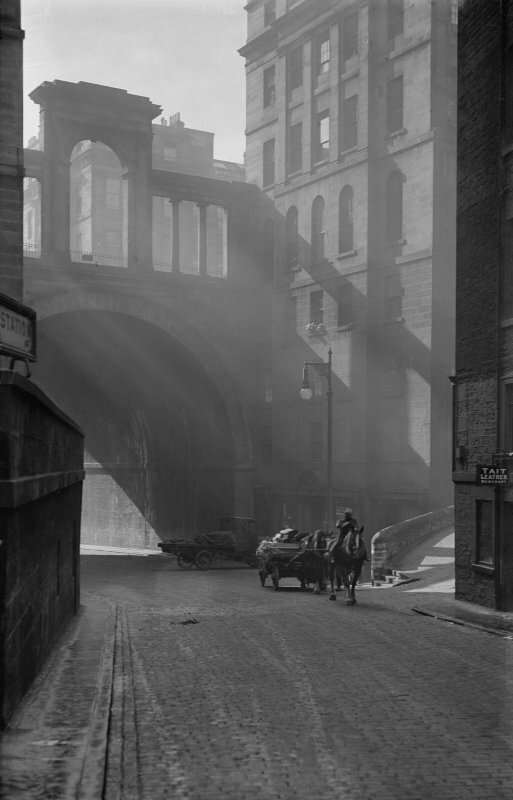 It was designed by Stevenson as part of the Waterloo Place building development for which Elliot was the architect.